This takes up the whole of the lower deck – 88 rows in a 3-4-3 configuration, making a grand total of 399 economy seats. It doesn’t look too crowded, mainly because there were no passengers on board as we were given a tour, but also because of the mood lighting, the fibre-optic star-effect lights in the ceiling, and the larger windows letting in a sunny Hamburg afternoon. 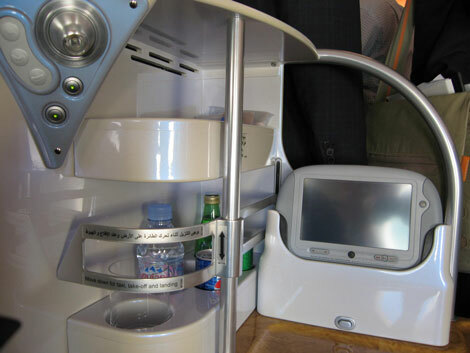 All seats have Emirates’ AVOD in-flight entertainment system “ICE”. Seat pitch is 32-33 inches, width is 18 inches, and recline is six inches, with an extra one inch “due to seat articulation”. The seats also have individual laptop power. At the back, up the stairs, and into the bar area for business class. It’s an unusual configuration and what you notice immediately is that every other row has no walkway. If the seats are close together, there is one, if not, they don’t. The problem with flat-bed seating, of course, is how you recline and extend the seat to fully-flat without having several feet of dead space between the rows. British Airways has a yin-yang configuration, with half the seats facing backwards, while Virgin goes for a herringbone layout and Etihad staggers the seating. 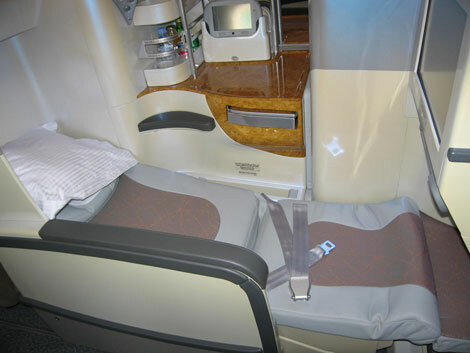 What Emirates has done is arrange for the feet to extend under the side table of the row in front, meaning the next row has to be sitting to one side. For those seats pressed together, there is an optional divider which rises between the seats, although whether people will realise they are booking seats so close to one another (or so far apart if they want to travel together) will be a challenge for the airline to manage for the first few months. For those who are further apart, it would be difficult to hold a conversation, assuming they wanted to. The seat has several pre-set positions, laptop power, your own minibar replenished with drinks during the flight and a good-sized table for working and eating. What is extraordinary about this new arrangement is that the seats have a different pitch depending on whether you choose an inner seat or an outer one. The stats are as follows: seat pitch is 39 and 48 inches, which extends to form 70 to 79-inch lie-flat beds. What that means is that if you go for an outside seat, you get more legroom both for sitting and sleeping, while the inside seats have less. Just how Emirates will sell both types of seat for the same price remains to be seen, yet it is doing so at the moment. I spoke with Terry Daly, Emirates’ divisional senior vice-president of service delivery, about this, and he said the difference was necessary because of the design of the seat. As for how it would be sold, he said that he didn’t think it would make any difference because the seat is so long anyway (ie: even in its shorter form). On the matter of pricing, note that although Emirates is not charging a premium for flying on the A380, you will find the aircraft is on the most expensive flight on a route (whether that is New York from August, or London in December). As you’d expect, there are sliding doors on the suites (which are more like cabins, really, but that terminology would be confusing). Inside, there is a fully-flat bed, lots of space, a giant TV and a real sense of privacy once you shut the door. What’s more, first class passengers have access to showers at the front, either side of a stairway down to the exit and straight off the plane. It’s difficult to give much detail on the showers since this was the one thing not being demonstrated with the plane being on the tarmac, but since I’m on the delivery flight tomorrow to Dubai, I will hopefully find out more, if they let me through the curtain.